Principles for designing sustainable medium density infill housing for subtropical South-East Queensland. Visualisation of possible application; allowing space for vegetation and minimising visual bulk in the design of a development’s street address. Image by MAS. 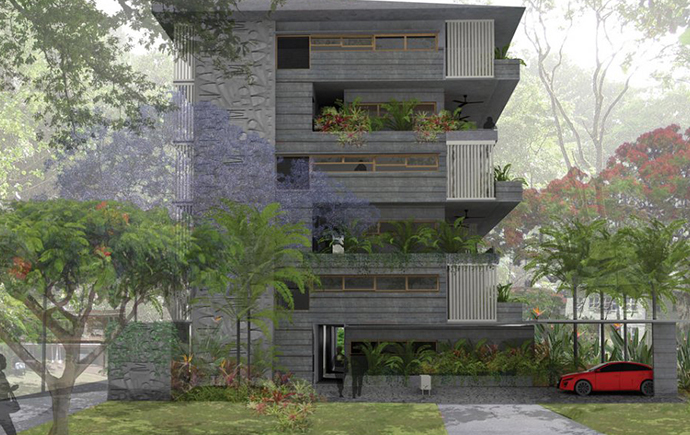 Design guidelines were prepared for 4-8 storey apartment buildings in a suburban infill context that embrace the sub-tropical environmental conditions of the South-East Queensland Region. 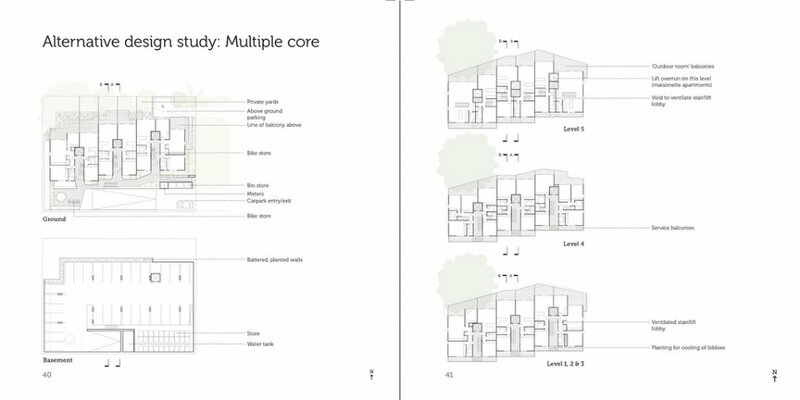 The project involved design studies in the area of Cleveland that produced illustrated guidelines for 10 principles of site-responsive and climate-responsive medium-density housing developments. 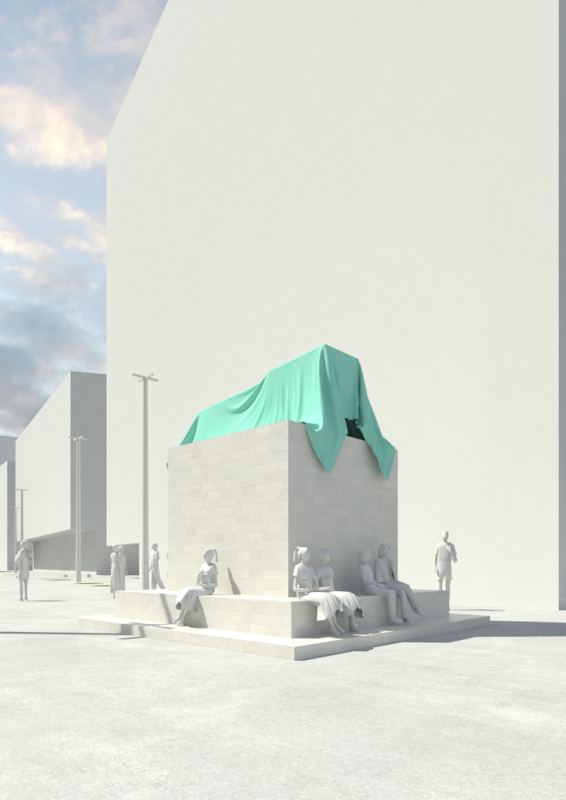 The emphasis is on simple initiatives to improve liveability and sustainability in dwellings and the surrounding urban environment. The case-study designs and other preliminary design models provide examples of possible/exemplar outcomes and illustrate the composite nature of design thinking. The primary audience for the guidelines is developers and planners involved in assessing development applications. South-East Queensland Council of Mayors as part of the larger Liveable Compact Cities Project. 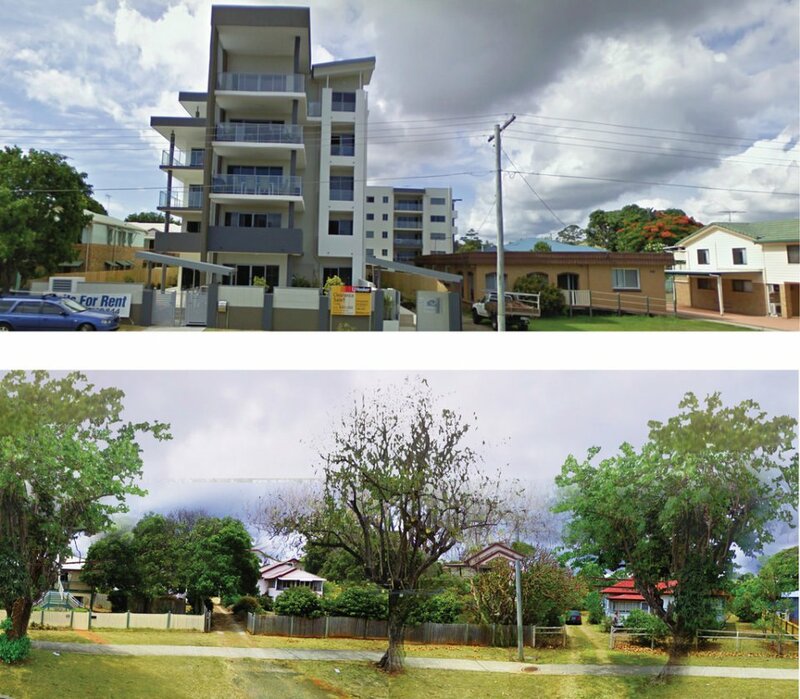 Relationships between typical ‘new’ and ‘old’ developments in Cleveland, QLD. Image by MAS. 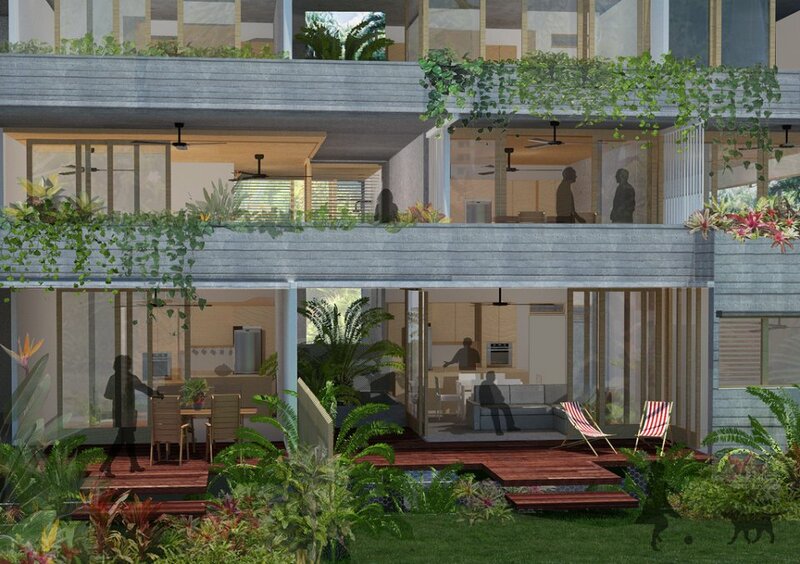 Visualisation of possible application; north-facing living spaces and balconies overlook densely vegetated yards. Image by MAS. 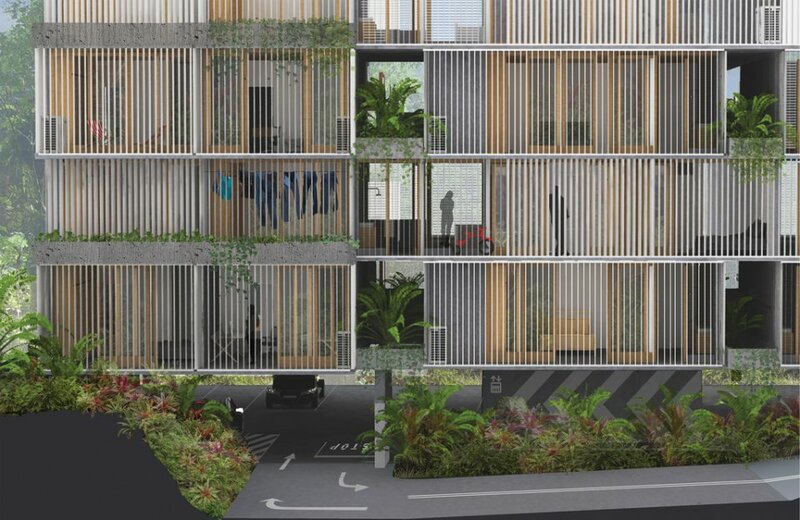 Visualisation of possible application; louvres and ventilated corridors respond to the sub-tropical climate, carpark entry and service balconies located on southern side. Image by MAS. Contents page of booklet, detailing the final guidelines. Image by MAS. Observations and analysis of factors affecting liveability and environmental performance of ‘typical’ developments in the current context. Image by MAS. Proposed alternative design model drawings from the guidelines book - spread one. Image by MAS. 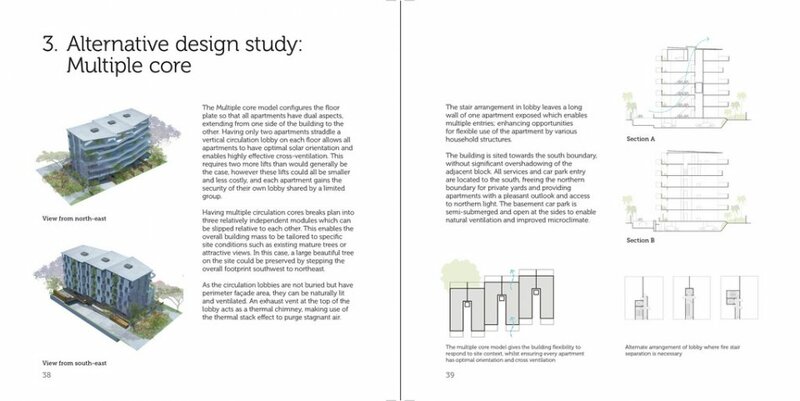 Proposed alternative design model drawings from the guidelines book - spread two. Image by MAS.